The front floor mats hook over the floor anchors, which keep the mats from sliding forward. 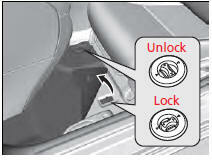 To remove the mats for cleaning, turn the anchor knobs to the unlock position. When reinstalling the mats after cleaning, turn the knobs to the lock position. Do not put additional floor mats on top of the anchored mat. If you use any floor mats that were not originally provided with your vehicle, make sure they are designed for your specific vehicle, fit correctly, and are securely anchored by the floor anchors. Position the rear seat floor mats properly. If they are not properly positioned, the floor mats can interfere with the front seat functions.